Jacob Simpson and James Read were racing at the Matlock Division 2 slalom, James came in 32nd on Saturday from a large field collecting 191 ranking points in Men’s K1, 16-year-old Jacob was competing at only his second event at this level and came 51st over all and 5th Under 18 and collected 43 points. On Sunday: James improved his position and came in 27th, and earning 239 points, while Jacob also climbed up the rankings slightly with a 48th place finish and earning 33 points. Jacob was also 4th Junior 18. The slalom season is now well underway and we are on the look out for more paddlers. The Club is developing new sessions and accessing better facilities, so why not come along and give it a go? We meet and Mondays and Wednesdays at Rickmansworth Sailing Club, where we can access the slalom site at Harefield. Alternatively you can park at the Coy Carp and walk along the canal, over the bridge at the cut and turn left and we are on the left as you go over the wooden bridge. 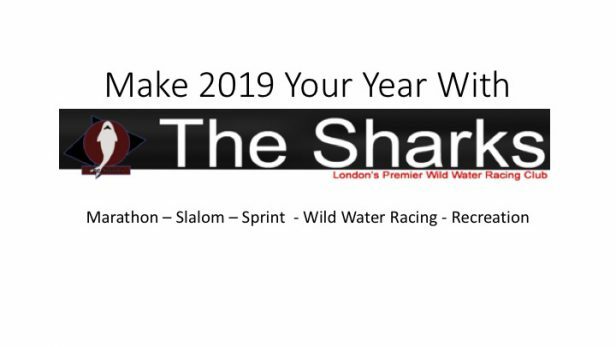 beginners always welcome, for more information call: 07951 770241 or email; slalom@thesharks.org.uk.